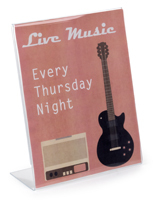 3.5" x 2" 4" x 5"
5" x 7" 5.5" x 8.5" 8" x 10" 8.5" x 11"
This table sign holder is great as a restaurant advertising tool! 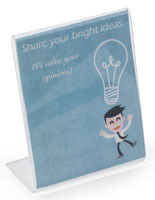 Use this acrylic frame to display 4" wide x 6" high pictures or signage. 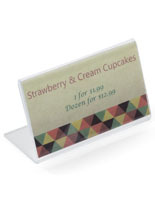 This table sign holder, menu card display, features a clear construction that provides an unobstructed view of the entire graphics. Each frame is constructed from one solid piece of acrylic. 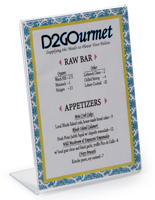 This table sign holder, menu display, is seamless thereby making it less likely to crack or break. 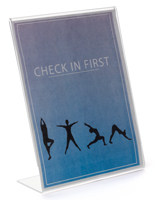 The open sides of this cheap picture frame allow users to perform quick change-outs. 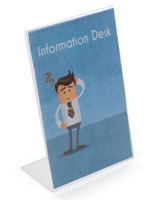 Update this table sign holder by removing the signage through one side and inserting new graphics through the other side. Single sheets of paper should be used with this acrylic frame to insure a proper fit. This table sign holder that is slanted provides an optimal viewing angle for passersby. 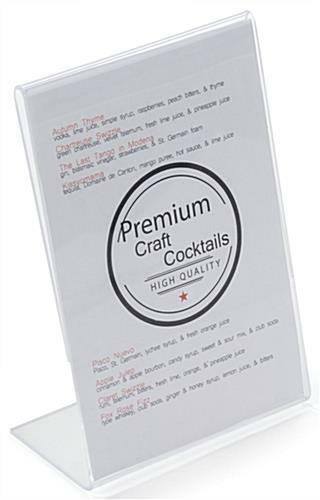 Place this economical menu card display on every tabletop in a restaurant to promote new menu items or a weekly drink special. 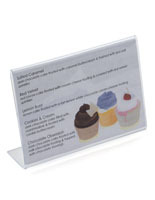 This table sign holder is an economy frame that is inexpensive yet durable. The sides of the acrylic framing are frosted and not clear like other similar units sold on this site. Most casual observers will not even notice this feature. 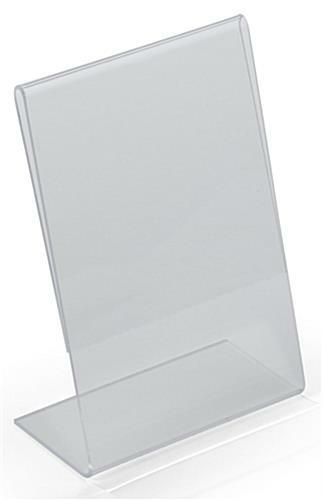 Buy this table sign holder, also known as a table tent, in larger quantities to have replacements on hand. I needed these to display pertinent information on tables at work. Perfectly fit my need. We love hearing this, Alane! Thanks so much for the nice review! 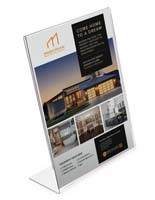 The plexi 4x6 sign holder has been a part of our marketing efforts for many years. It is a handsome, reliable, lasting way to display our Bio and Made in the USA signs in gallery and gift shop presentations of our product with only pennies on the dollar to CoGS with a great footprint to RoI ratio. This is exactly what we needed and reasonably priced, too. Received shipment much quicker than expected. Great for the price and fast shipping! The product was exactly what we ordered and was delivered so quickly!!! We love them! We bought something similar from an office supplies store for 4 times the price and the paper slips out. The paper stays exactly in place with these! Love them! Thank you for the great product and service ! Thanks so much for the great review, Jodi! We are happy that you were pleased with your purchase.